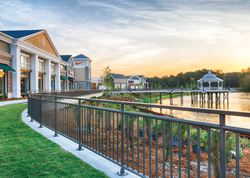 Hollaender Manufacturing, manufacturer of Interna-Rail aluminum railing systems, was chosen by Architects Orange, Inc. to provide non-corrosive, aesthetically pleasing, and functional handrail systems for Norfolk Premium Outlets in Norfolk, Virginia. With extensive exterior railing included in the project design that represented a major design element, Chris Gutierrez, Associate and Project Manager at Architects Orange, knew it was critical to specify visually impactful, non-corrosive railing systems. 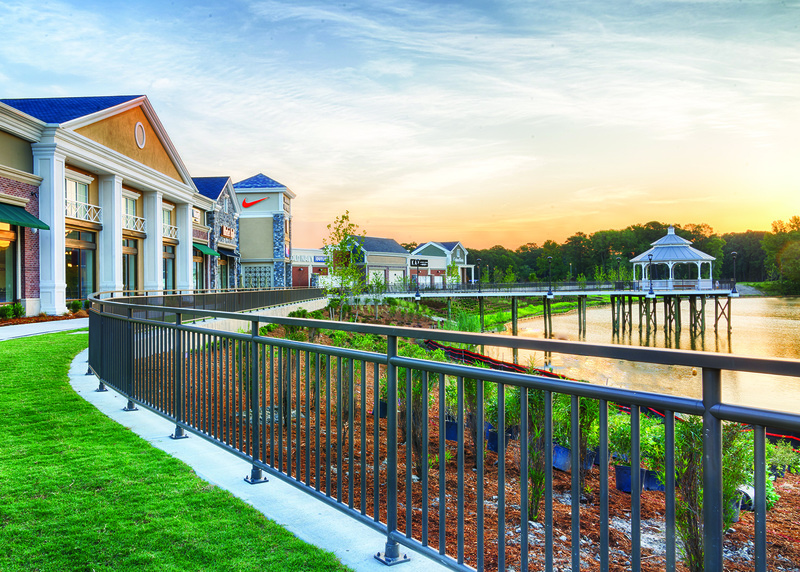 Hollaender Manufacturing, manufacturer of Interna-Rail aluminum railing systems, was chosen by Architects Orange, Inc. to provide non-corrosive, aesthetically pleasing, and functional handrail systems for Norfolk Premium Outlets in Norfolk, Virginia. Located in the heart of the Coastal Virginia region between Norfolk and Virginia Beach, any railing system installed at the high-profile Norfolk Premium Outlet retail destination would need to stand up to harsh atmospheric conditions caused by the nearby salt waters of Chesapeake Bay. Simon Property Group is a global leader in the ownership of premier shopping, dining, entertainment and mixed-use destinations, including Norfolk Premium Outlets. They used Architects Orange, Inc, a highly respected, full service architectural firm out of Orange, California as design architects on the Norfolk project. With extensive exterior railing included in the project design that represented a major design element, Chris Gutierrez, Associate and Project Manager at Architects Orange, knew it was critical to specify visually impactful, non-corrosive railing systems that could be coated to match existing powder coated and anodized design elements on the grounds. Gutierrez ultimately specified Hollaender’s Interna-Rail aluminum component railing system with vertical picket infill panels and a distinct rectangular top rail. To meet the coating requirements, Hollaender sourced a Tiger Drylac product that emulated the desired color requirements and that met AAMA 2604 specifications. The result is a long lasting handrail and coating that will withstand the rigors of the harsh outdoor environment.